She is 10kg now, the biggest baby around us. After the earthquake, our life has a bit changed. First of all we see lots of scenes of the disaster in TV every day. And they tell about the accident of the nuclear power plant. I don't afraid of it too much but I'm worrying about the people who works in it now. We have less electric power because the nuclear power plant and also we lost some thermal power plants. So we have less trains and shops has less lights and close earlier than before. The life with less electric is a bit inconvenience but we can notice how it's important for us. But we still enjoy our life so much. I teach how to sew baby wears to my friends. I didn't expect that younger mothers want to sew. But now they enjoy sewing so much. 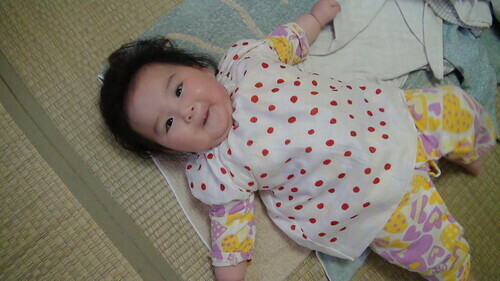 These days I frequent a big house where babies and elderly people get together. 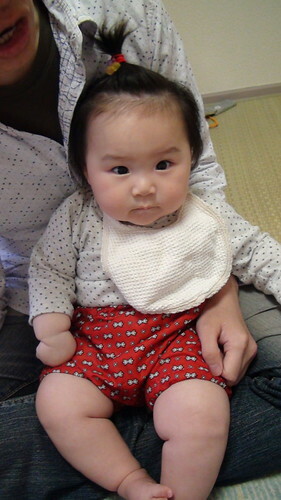 Because we live far from our parents, I want Miyu to meet elderly people as much as possible. After the earthquake the place got more important for us because we don't want stay home alone. 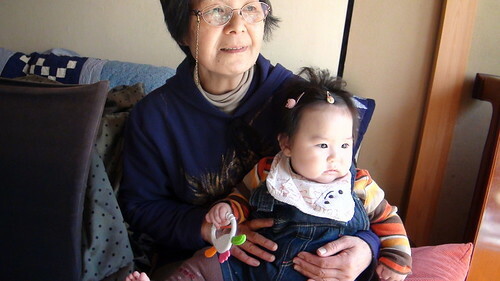 We can talk with other mothers and eldery people so we can relax and forget the disaster. I'm happy with many people around me (* v *)!!! Of course, with you all!!! !